The winners of the men's and women's 2018 B.A.A. 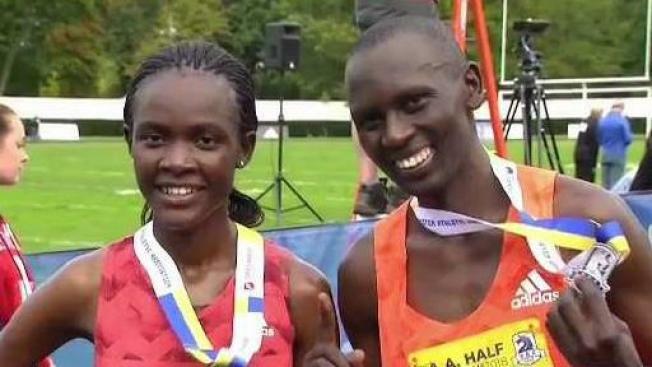 Half Marathon are Daniel Chebii and Joan Chelimo respectively. Chebii, a Kenyan man who has run the half marathon twice and won the B.A.A. 10k twice, won the men's race in 1:03:08. "To be a champion is something very great," he said. "So I am happy to be in Boston." To prepare for the half marathon, Chebii ran 21, 25 and 30ks. He says he is happy to be back in shape. The first runners have crossed the finish line just about an hour into the B.A.A. Half Marathon. Reporter Nia Hamm talks to the winner of the men's race. Chelimo, also from Kenya, won the women's race in 1:09:34. She said her three-year-old daughter Ariana motivates her to keep going. 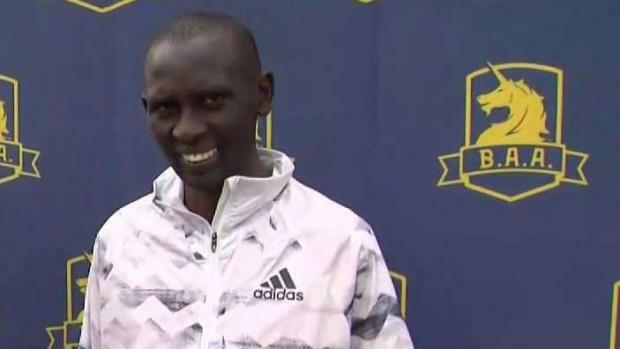 "When I get tired in the race, like the last three days, I just think about her," Chelimo said. According to officials, 6,530 runners from 40 states and nearly 90 countries participated in this year's event. Many of the runners are raising money for cancer research. The race's director, David McGillvray, says charity is central to this race. "It's a combination of raising the level of self-esteem and self-confidence of people. But also it's about feeling good, feeling good that they are in good shape, they're in good health, and then being able to use that to give back and to raise money for those who are less fortunate." There is also a wheelchair division in the race. The first runners have crossed the finish line just a little over an hour into the B.A.A. Half Marathon. Tony Nogueira, who is from New Jersey and has won this race 12 times, won the men's wheelchair race in 53:37. "It's great. Today was great weather. It didn't rain, no winds... it was a great race," he said. Carla Trodella, of Danvers, Massachusetts, won the women's wheelchair race in 3:21:04. This race has raised millions of dollars for cancer research, and 475 runners raised $600,000 for the Dana Farber Cancer Institute and the Jimmy Fund. Dana Farber, the presenting sponsor, and the Jimmy Fun have partnered to run the charity arm of the race. Many runners spend months training and even running other races to get ready for this event. The 18th Annual B.A.A. 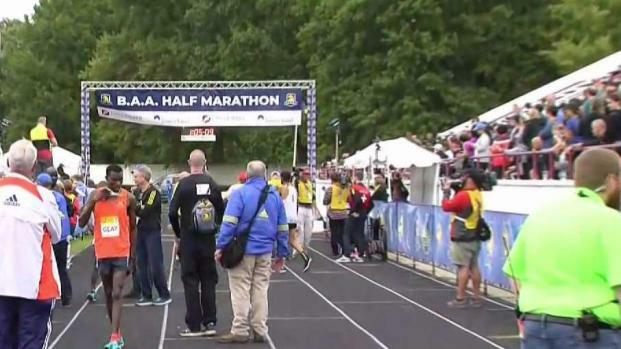 Half Marathon began Sunday morning at 8 a.m. with thousands of runners from across the world participating in the event. But for some, the best part is running it alongside thousands of people with the same goal. "When I'm running a big race it's definitely yeah you get a little boost, a little pick up," participant Pete Towner said. "I don't know what their ultimate goals are but everybody wants to go to the finish line and have a big smile on your face at the end." 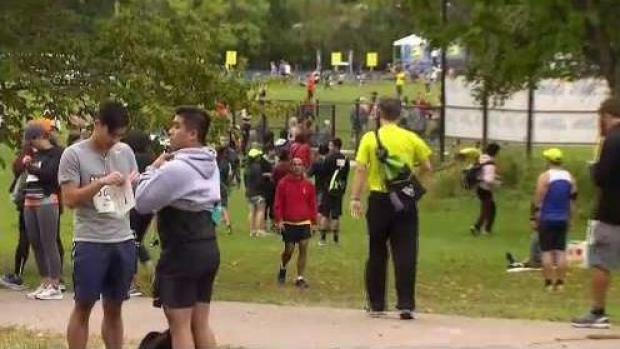 The race began at 8 a.m. in Boston's Franklin Park, and runners had three hours to finish the race. Once official, results will be available at www.baa.org.